First Timer Backpacker? No Problem! Low cost travelling has been a trend lately and a lot of first timers are not sure what to do. Don't worry! Going abroad for the first time is not as scary as it seems. I had my first overseas travel last year and I will share my experience in this article. How did I get to Singapore? It was a very impulsive decision, by the way. Simply because I hate being underestimated by my dad every time I said I wanna go overseas. "What are you gonna do there? It will be the same as in Indonesia." "Nah, you are just eaten by rich people lifestyle." I heard it many times and I became discouraged every time I heard it. I had enough, so I decided to make a passport even though I wasn't really sure where and when to go. Besides, I thought I would be more prepared if one day I found cheap airline tickets, hehehe. I heard people said making passport in Indonesia is complicated, expensive, and that we need "calo" for it. I did it by myself and it was really simple and easy. I don't know if it's just in Bali or not, but I feel a lot of public services in Indonesia are getting better. I had my national ID card done in 2 hours, one visit (2 hours to queue, but the process is actually just 15 minutes including getting the card). So was my driving license. The officers are nice and helpful. Don't worry about people who have no manner to queue, they use electronic numbering so you can just sit and relax waiting for your turn. You can read my experience in making passport here. So, when it was done, I impulsively texted my friend, Anggie, about going to Singapore. I...just like what I said, it was really impulsive. Anggie was my classmate in my Japanese course. I just said, "Let's go to Singapore! ", she said, "Okay!". I was so surprised too, finding out she's as impulsive as I am :P We found low price Jetstar ticket (two-ways for IDR 800000). We use no check in baggage but Jetstar allow more cabin baggage than Air Asia, so I was fine with it. We were backpacking because we literally only brough one backpack with us. We wanted to stay in a backpacker hostel at first, but then Anggie suggested to stay in Hotel 81 Balestier. We got about IDR 850000 per night, but it's double bed. It's a nice and simple hotel for short staying. It also provides wifi access and the bus stop is right in front of its front door. So, after all of those booking thingies, I told my Dad. He was surprised of course, but what could he say? All things are booked. He just laughed and after that time, he never forbid me going abroad anymore. Hahaha. It's a nice trick but I'm not sure if it's working with your parents. Then, we arrived at Singapore! Yaiy! The first night, we "slept over" in Changi Airport. As you can read in many blogs, Changi Airport has a lot of services especially for their transit passengers, including Snooze Lounge! Right, a lounge for snoozing. But by that time it was full, so we slept on a sofa. Actually, I don't suggest you to minimize your accommodation budget by sleeping at the airport. In many blogs I read sudden security check often happened at midnight to make sure those who slept in the airport were only transit passengers. We did that because our flight landed at 1 am and had nowhere to go. We were lucky too because there wasn't any security check. Our travel in Singapore was really fun. We only went to cheap (or free) tourism places, such as Bugis Market, Merlion Park, and we only went to Sentosa Island for a chocolate store called Candylicious. Seriously, the store is what they called heaven (for sweets lover). I really wished the chocolate displayed in my picture was a real thing, hahaha. From the first time thinking about this travel, I didn't mean it for shopping. Even though we were only walking and walking...and walking... (I got foot massage right after I came home :P) but unexpectedly I really enjoyed it so much, especially seeing how things were different from Indonesia. 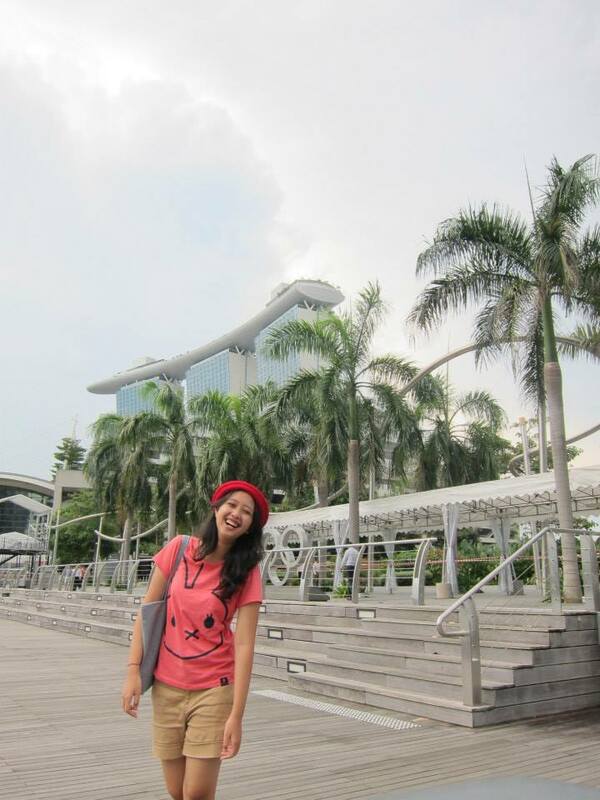 Besides their clean and tidy city image, I realized that Singaporean don't smile often (at least those who I saw). Even in services, they don't smile but they did their job really fast. It's really different from Japan, which is every single job is based on service (I'll write about my journey in Japan later). For those who get used with smiley services might find Singaporean services are rude. And one more thing captured my attention was those who did cleaning job in fast food restaurants were elder people. In Indonesia, elder people supposed to enjoy their life, stayed at home in the care of their children and grandchildren. Maybe elder people in Singapore feel that they should still work as long as they can. I don't know, but it was just cultural things that we shouldn't see from our own culture's point view. Some people think backpacking is all about being impulsive. Just grab your clothes and go anywhere you wanna go. But for me, I'd rather have an itinerary and budget check, especially if this is your first time travelling abroad. It helps you to save your time and money. At least book a hotel/hostel before, in high season it might be hard to find a vacant room. Also, at least list places you want to go (and how to get there) and main things you have to buy. If you want to buy souvenirs for family and friends, list what kind of souvenir you want to give and how many of it, so that you can spend what is left for your self. Read as many as traveler blogs as possible to get you a general image of the country, especially do and don'ts. Take your self a city map and MRT map in Changi. Or, you can download those map in your smartphone from your application store. Make sure the map works offline. Even though it was a safe country, you have also be careful of your belonging, especially in Bugis Market. I had a bad experience about this in my second visit to Singapore (will write later). Don't let your guard down. Indonesian people favorite food court is in the basement of Lucky Plaza. They even have Indonesian food there! Don't buy electronic stuffs in Lucky Plaza and Sim Lim Square. Google it and you will understand why I said so. Unless you find out that the FINAL price has a big different, I think the price of electronic stuffs in Singapore is almost the same as in Indonesia. Buy your self an EZLINK card in MRT station or any 7Eleven stores. At first it seems a bit pricey, but it is a lot easier when you have it, especially when you plan to go back to Singapore one day. You can use it for taking MRT or bus. One card only apply for one person. Tourism tourist pass seems tempting but when I think about it, I don't really need to ride public transport that much in a day. It's not like I will go back and fourth or take off in every station. If you don't want to buy, borrow it from a friend who have it. Pay attention for liquid limit you can bring inside the cabin for international flight. One person can only bring maximum 10 containers of liquid (cream) and each container should not exceed 100 ml. Put it in one transparent bag or pouch. You don't want your expensive perfume got thrown in front of your eyes, do you? Pack as lightly as possible because you will bring more stuffs back home. If it's necessary, roll your clothes so you have more space in your backpack. You can see a tutorial here. Pay attention to your cabin baggage limit. Changi check in counters are pretty strict about it. I saw some Indonesian people throwing away their stuffs because of it. Keep a copy of your passport and other important documents in a separate place in case the documents got stolen (I really hope not). Or you might want to scan in and keep it in your email or cloud drive. That's all I can share to you. Don't be afraid to take your first overseas journey! Indonesian Passport Bureaucracy: Simple and Easy!